presents a plaque to IPS' Keith White. Drum Corps International helped kick off the 2009 Bands of America Grand National Championships Wednesday evening during a special recognition of Indianapolis Public Schools (IPS) administrators and music directors at Lucas Oil Stadium in downtown Indy. The presentation, which took place during the opening of the IPS Marching Band Tournament, recognized IPS for providing housing for 10 Drum Corps International groups during the World Championships this past August. 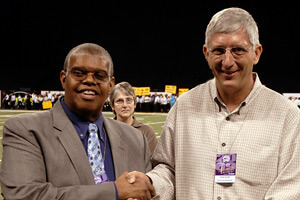 DCI Executive Director Dan Acheson, Chairman of the DCI Board of Directors Mark Arnold, and others thanked IPS Superintendent Dr. Eugene White, District Director of Instrumental Music Keith White and several band directors for their assistance. Keith White says that having the drum corps stay at those schools over the summer was a positive experience for band students who had the opportunity to watch the corps rehearse during practices just prior to the start of the school year. "It's really great for the band kids because they get to see really quality work [from the drum corps]," said White. "Everybody in the school was astounded at how professional and how well they practiced and were so focused. A lot of the athletic teams even went out and watched them because of that focus." field to play the National Anthem. 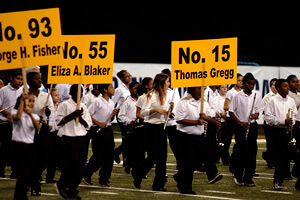 The IPS music programs are stronger than they have been in many years and continue to flourish thanks to the support of school administrators and the superintendant says White. The music education curriculum has also been bolstered by a $1.3 million donation by the VH1 Save the Music Foundation which has helped restore music programs in 42 of the IPS schools. That couldn't have been more evident at the intro of Wednesday's tournament when 650 elementary school students proudly marched into Lucas Oil Stadium to play "The Star-Spangled Banner" with the Indiana State University Marching Band. White additionally credits local organizations like Drum Corps International for their continued support in keeping the IPS music programs healthy. "Now that we have all of these organizations like Drum Corps International in town that are willing to partner with us, it makes us even stronger ... It's a win-win situation for both sides," he said. The Bands of America Grand National Championships will continue on Thursday, Friday and Saturday of this week at Lucas Oil Stadium. The performances of all 100 competing high school marching bands from around the country can be seen live online in a special Music For All Webcast powered by the Drum Corps International Fan Network. Visit mfa.thefannetwork.org for more.